As my first post hinted, I suffer a fair bit with getting a good nights sleep. We all do from time to time but it gets brushed under the carpet a lot more than it should. Sleep is ridiculously important to our overall health and without it, we cease to function in a productive way. As you can imagine, being without beauty sleep makes my skin look sallow, my eyes tired and my overall complexion fairly dull. With this in mind, I'm constantly on the look out for products to either help aid my descent into sleep or to cover up a particularly bad evening. 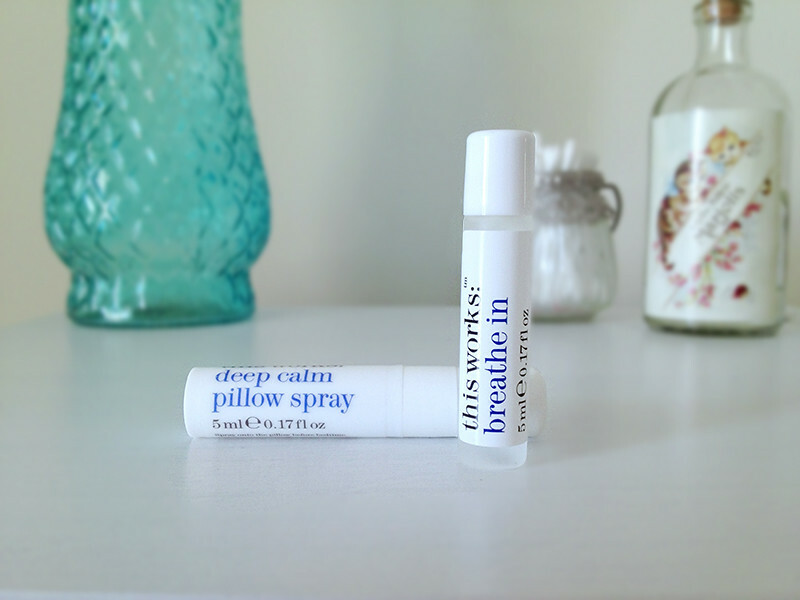 One product I've experimented with recently has been This Works: Deep Calm Pillow Spray and Breathe In Roll-on. A hyped up product touted to be a miracle worker, if I were led to believe all the reviews I had seen popping up around the internet. Nabbing a few samples of the travel size bottles, I figured it couldn't hurt to try it over a few nights and see if there was any improvement. The first thing to note is the fantastically soothing smell of Lavender, Vetivert and Camomile essential oils which are known to naturally relax your body and mind and help ease you into a peaceful sleep. There are also Frankincense and Eucalyptus notes to clear the airways, effectively giving you a little extra boost before turning in! A couple of pumps on the Deep Calm Pillow Spray over your pillow starts that heavenly process of preparing for sleep. I tend to let this sit while I complete the rest of my night time regime to give it time to really get into the fabric before I disturb it. 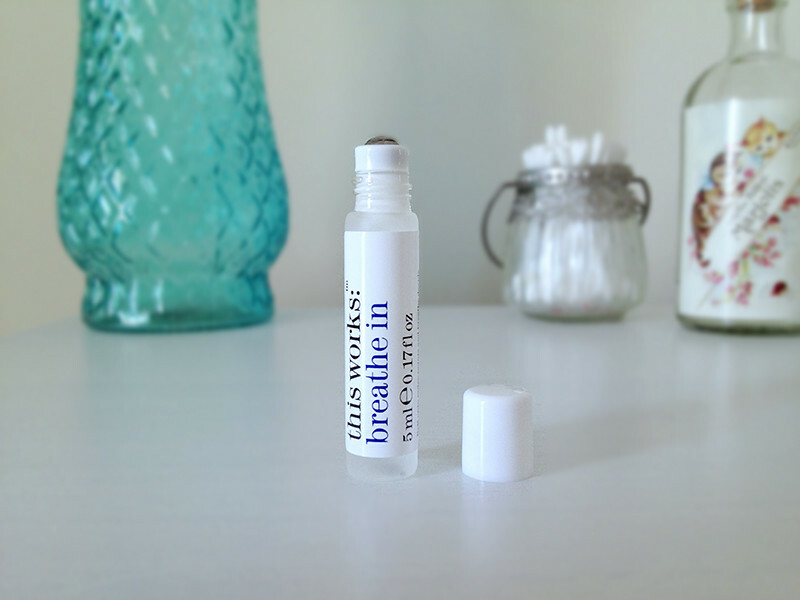 A few well placed dabs of the Breathe In Roll-on onto the pulse points over your body is the final step before resting for the evening. After a few nights of getting into a pattern of doing this and I did notice a difference in how I drifted off. I was much calmer and positive about having a decent rest that it helped influence the natural and soothing properties of the essential oils. I'm definitely going to be trying the rest of the products in this range. Have you tried any This Works: Sleep products? What did you think of them? I have not tried this as it isn't available in the US, but I love the idea of rolling the product onto your pulse points! In a world of sleep sprays, that is definitely a more novel way of doing things! I've got another set of testers which I can pass your way if you want to try it? The spray is used up in about 4/5 sleeps, as I usually have three or four sprays a time to really sink it deep in there. However, the roll-on seems to last for an age and you can roll it directly on to the pillow too (which the say on the website) so that's really handy. I want to invest in their travel range soon, I've heard great things. Please let me know what Bath & Body Works version is like, I want to try as many as possible!